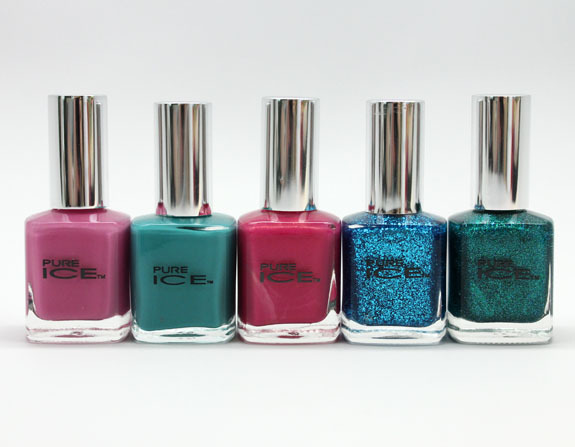 The Pure Ice summer 2013 nail collection features a bunch of new nail shades including these five I have for ya this afternoon. I haven’t had much experience with this brand so it was nice to try them out. Not to mention the price is RIGHT! The formula was really nice with all of them including the glitters, and they are big-three free. They had a really nice consistency, nice brushes and covered in two coats. Definitely no cheap, gloopy polish here! Feisty is a medium pink creme. It’s a vivid pink but kind of subdued at the same time. This was the only one where I had any slight consistency issues and they weren’t big ones. It wants to be a little bit patchy, especially if you have ridges like I do. But really no biggie. Jackpot is a bright magenta with pink shimmer. I am in love with this shade! It’s super flirty and feminine looking. The shimmer isn’t hidden at all it’s very “there” and really nice. It isn’t a jelly but has this kind of squishy-like look to it. Scream is a turquoise creme. This shade leans a little more to the blue of turquoise than green. It’s not especially unique I don’t think, but still a nice shade. Watch Me Go features super fine sugar-like green and blue glitter in a clear base. Since the glitter is so small it applies so easily and evenly. It covers really nicely with just one coat and looks cool. I love these types of super easy to work with glitters. Wide Awake features multi-sized blue glitter in a clear base. This one applied nearly as easily as Watch Me Go, but not quite. Some of the larger glitter pieces tended to clump together, but overall I got good coverage with two coats. Overall: I am pleasantly surprised with how nice these were. The colors might not all be that unique, but the cost and the formula was pretty impressive. I especially love Jackpot and Watch Me Go. Availability: Walmart and the Pure Ice website. Pricing: $1.99 for 0.5 oz. 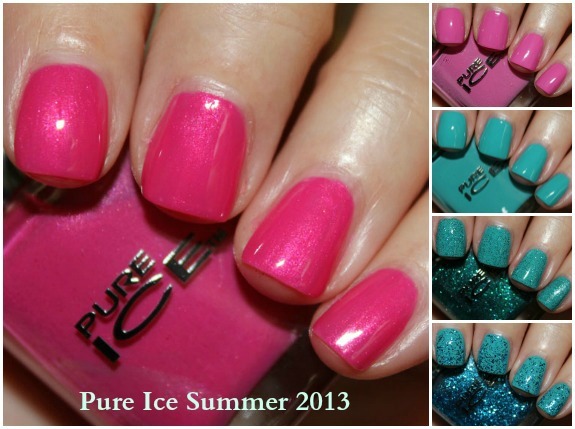 What do you think of these new Pure Ice shades? Love the price? A note about the cruelty free status: I marked it as undetermined because they were bought by Revlon, who aren’t considered cruelty free anymore because they now sell in China, where testing is legally required. However, that doesn’t mean Pure Ice also sells there. So I’m not 100% sure! Essie Swatches – Limited Editions Brought Back!